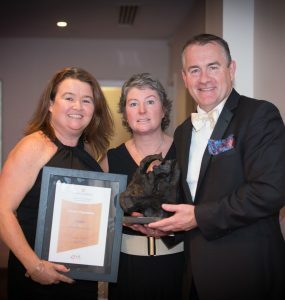 “Honoured” and “Over the moon” were the sentiments expressed by Brendan Ring, CEO and Co-Founder of Cliona’s Foundation following their announcement as the winner of the Best Community Entity Award 2016 at the Limerick Chamber Regional Business Awards 2016 last Friday night at the Strand Hotel. There were 9 Award Categories in total and Cliona’s Foundation was shortlisted for the Community Entity Award 2016 alongside Tait House Community Enterprise and Focus Ireland. “We were delighted just to have been shortlisted in the 1st place and have a presence here with the wider Limerick Business Community, so this is the absolute icing on the cake,” said Brendan shortly after the announcement was made. 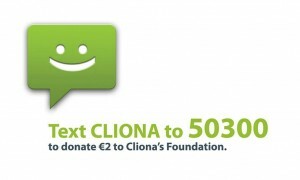 Cliona’s Foundation provides financial support to families of children with a life limiting illness to assist with the non-medical costs of looking after their child. Many of these parents are away from home for long periods of time, paying for accommodation, food, transport, having to take time out of work, get others to look after their other children and also have to purchase specialized equipment. It has been a super year for Cliona’s Foundation in terms of fund raising but they have been working hard to increase their profile both locally and nationally so as to increase the support they receive but also and more importantly let families that need help, know that there is an organisation that can help them through what is a very tough journey. “Continued fundraising in 2017 will be another challenge but this Award is a great platform for us to move forward into a milestone year for the Foundation as we celebrate our 10th Anniversary. This Award is more special to Cliona’s Foundation as they approach the 10th anniversary of the passing of Cliona in December. The award is dedicated to her and all the children the Foundation has been able to provide support to in her memory.